These Cobb salad recipes can be served as lunch or dinner. They also work well for bringing to a dinner party or potluck. You can change up your recipe how you like it also by adding something different or taking something out you don't like. 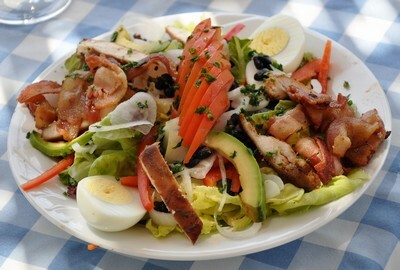 As the history of Cobb salad goes it is said to have been created by the Brown Derby Restaurant in Hollywood. While a chef was looking for a midnight snack he threw a little of this and that together until voila a Cobb salad was born. Please share your cobb recipe salad too! In a serving bowl add lettuce and spinach to bottom. Sprinkle with cheese and arrange remaining ingredients attractively in your bowl. For the Cobb salad dressing try a homemade ranch dressing. Lightly coat both heads of romaine, corn, zucchini, red peppers, and shrimp with olive oil, dust with garlic powder, and grill until done. Chop/dice the vegetables into 1/2" pieces. Prepare the dressing by blending ingredients together thoroughly. Set aside the shrimp and cheese. In a large bowl, mix together the chopped grilled vegetables with the remaining ingredients and the dressing. Divide the salad onto 4 plates, and top each salad with 3 jumbo shrimp. Sprinkle cheese on the tops of the salads. 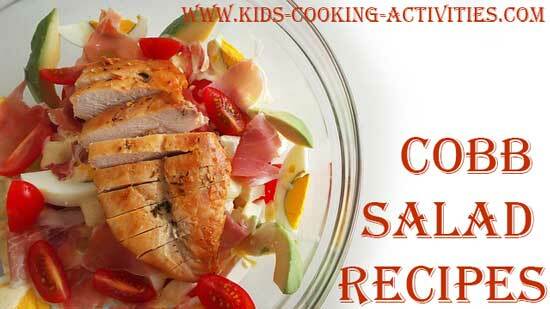 Place all the salad items in a large bowl and gently toss together. In a separate bowl mix all the dressing ingredients together except the pine nuts. Pour dressing over the salad and top with toasted pine nuts. To toast the pine nuts place a little olive oil or non stick spray in a non stick frying pan and toast the pine nuts for approximately 2 minutes. 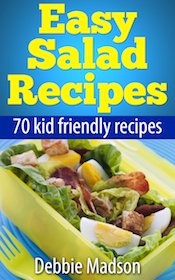 Do you have cobb salad recipes to share?